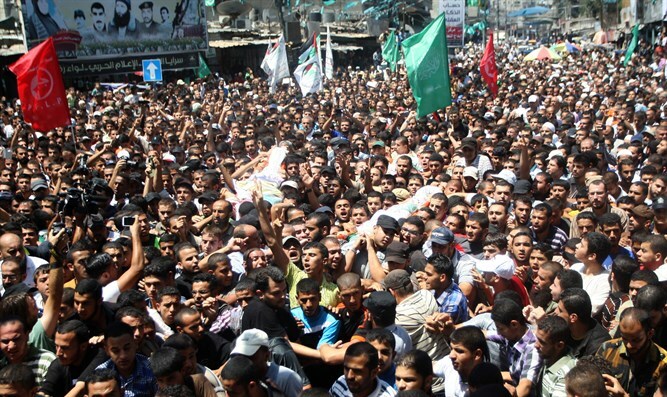 Thousands attend funeral of Hamas terrorist, call for 'revenge' against Israel after unknown Gaza gunmen kill Hamas leader. an official from the Palestinian Islamist movement gunned down the previous day. "Revenge, revenge!" called participants at the procession for Mazen Faqha, 38, who was shot dead by unknown gunmen in the Gaza Strip on Friday. Hamas-nominated attorney general Ismail Jaber on Saturday blamed Israel for the killing. "This assassination has the clear marks of Mossad," he said, referring to the Israel's spy agency. According to Israeli media, Faqha was responsible for cells of Hamas's military wing, the Ezzedine al-Qassam Brigades, in Judea and Samaria. Israel arrested Faqha and sentenced him to prison over suicide attacks which killed hundreds of Israelis during the second intifada, or uprising, between 2000 and 2005. He was released in 2011 along with more than 1,000 other terrorists in exchange for Gilad Shalit, and transferred to Gaza. Palestinian Authority leader Ismail Haniyeh and Gazan Hamas leader Yahya Sinwar headed the procession from the Shifa morgue to the Omari mosque, an AFP photographer said. Khalil al-Haya, a deputy to Sinwar, promised retaliation. "If the enemy thinks that this assassination will change the power balance, then it should know the minds of Qassam will be able to retaliate in kind," he said.